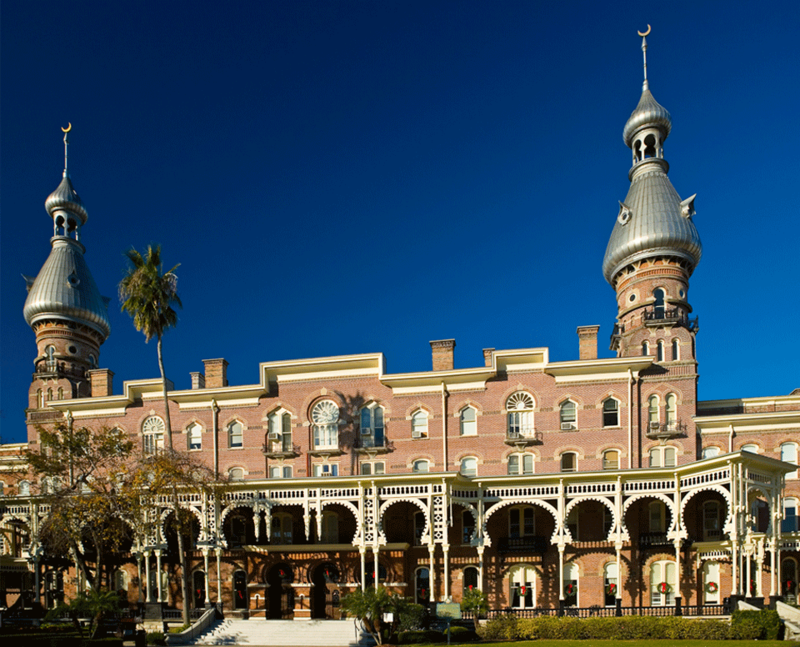 Beneath its soaring minarets accenting the Tampa skyline, the Tampa Bay Hotel provided its guests with the utmost in elegance and luxury in the 1900s. Today, the Henry B Plant Museum faithfully recreates the ambiance early Florida tourists experienced, down to the furnishings, lighting fixtures and art. This architectural icon has stood guard over downtown Tampa for more than 100 years. Constructed between 1888 and 1891 for an estimated $3 million, the Tampa Bay Hotel was the quintessential Victorian resort hotel, a building not intended merely as a place to stay but a destination unto itself. The hotel was built by railroad entrepreneur Henry Bradley Plant as part of his massive venture to open Florida’s west coast to tourism and commerce. Like a modern-day “Club Med,” the hotel was totally self-contained and included amenities ranging from telephone service in every room to tennis, golf and quail shooting. For the hotel’s design, Plant and his architect John A Wood produced a building unrivaled in style in Florida or the nation: a Turkish and Moorish fantasy of minarets, domes, cupolas, horseshoe arches and rambling verandas. Today, the Henry B Plant Museum will whisk you back to the hotel’s Guided age, a magical time in its history when formal dress for dinner was de rigueur and rickshaws carried guests through the hotel’s exotic gardens. Established in 1933, the museum’s mission is to display and interpret the hotel as it appeared to its first guests. The museum shows the visitor what the guests did rather than simple display furniture. Exhibits on sports and recreation and gardens and outdoor furnishings help to bring the hotel’s past back to life. Special exhibits such as the ongoing “Splendid Seats and Curious Chairs” and the annual Victorian Christmas Stroll focus on different parts of the museum’s collection and the hotel’s history. The Spanish-American War Room tells the story the hotel played in the 1898 conflict between the US and Spanish-held Cuba. Because Tampa was the city nearest to Cuba with both rail and port facilities, it was chosen as the point of embarkation for the war. For the role it played in the war, the hotel was designated a National Historic Landmark in 1977.